23-Dec-2016 - Updates from Purestorage and Tegile! 28-Oct-2016 - DriveScale joins VisioCafe! 05-Jan-2016 - INFINIDAT joins VisioCafe! 05-Oct-2015 - Nutanix joins VisioCafe! 27-Apr-2015 - AlienVault joins VisioCafe! - AlienVault joins VisioCafe with a new collection for their Remote Sensors and Servers. - Alcatel-Lucent Enterprise releases their Visio collection for their LAN, WLAN, WAN, and Data Center solutions. 13-Apr-2015 - HP and Lenovo Updates! 07-Apr-2015 - Updates, Updates, UPDATES! - The Dell collection has added their new PowerEdge FC430 & FD332, the IBM collection has added the Flex System SI4091, the Lenovo collection has added their new RackSwitch G8272 & G8296, and the NetApp collection has added new 3D shapes and updated drive shelves. 02-Apr-2015 - Big Tegile Update and new Lenovo shapes! 23-Mar-2015 - NexGen Storage joins VisioCafe! 05-Dec-2014 - Pluribus Networks joins VisioCafe! 06-Oct-2014 - HP Updates again! 12-Sep-2014 - CheckPoint and Coho Data join VisioCafe! 11-Apr-2014 - Gridstore joins VisioCafe! 25-Feb-2014 - X-IO Technologies joins VisioCafe! 09-Dec-2013 - Big HP Update! - The HP collection has added a lot of Networking products including new 1410, 3600 and 5930 series switches as well as a new Wireless client bridge and many modules for the 10xxx, 11xxx, and modular zl series switches. There are also several new storage products in the StoreAll, StoreEasy, and StoreOnce sets as well as updates to the 3PAR StoreServ and XP sets. 02-Dec-2013 - HP Updates again! 06-Nov-2013 - HP Updates again! 15-Aug-2013 - Oracle Updates and New Templates! 13-Aug-2013 - New Dell Stencil! 16-Jul-2013 - Tegile Joins VisioCafe! 27-May-2013 - SGI Joins VisioCafe! 17-May-2013 - Tintri Joins VisioCafe! 29-Apr-2013 - Penguin Computing Joins VisioCafe! - Ricky Harding adds a new set of computer icons for logical design. - The VSDfx collection has added a new set of 3D transportation shapes including a Cruise Ship, Container Ship, Airliners, Corp Jet, Bus, Taxi, Sports Car, SemiTrailer Trucks, Moving Van, Delivery Truck, Fork Lift, and Several Trains. - The HP collection has added logical shapes for the i4 Integrity systems, SL270, and DL320e. Added all StoreEasy NAS systems. Added ML310e front, rear and front open views. 05-Nov-12 - Lenovo Joins VisioCafe! - Hayden Searle adds a new McAfee Endpoint stencil set to his collection. 11-Jun-12 - New collection from Exagrid Systems! - The Fujitsu FTS set just Updated their Cloud, Racks Accessories, Rack Server and Tower Server sets. 16-Apr-12 - New IBM Flex System Stencil! 26-Mar-12 - New collection from Aerohive Networks and Updates from HP! 06-Mar-12 - Dell, HP and IBM have all released their new generation of servers! 13-Feb-12 - HP Updates and a new collection from microdrones! - microdrones joins VisioCafe with Visio stencils of their Quad-Rotor RC UAV microdrones. 29-Dec-11 - Dell Updates again! - The IBM collection has added several Storage, NAS and storage networking items. - The Endace collection has a new set of stencils for their high performance network monitoring and analysis solutions. - The Fujitsu collection has updated their PRIMERGY RX Servers as well as the Racks and Accessories file. 20-Oct-11 - Oracle joins VisioCafe! - The HP collection has added several 3D shapes to the Tape and Disk sets, as well as many new Desktops and Workstations. - The VI collection has updated their Visio shapes for their SAN monitoring solutions. - The HP collection has added the FC LTO3280 and SAS LTO3000 as well as a correction to the BL460 G7 logical shape. - The HP collection has added the new JC691A and JC694A A5830AF Series Switches, as well as added Generic SFP and QSFP shapes throughout the networking set. - The HP collection has added several V-Series switches and Wireless devices to the Networking set, as well as a re-organization of the Wireless files. Many items were also moved out of the current networking files into the classic files. - The EVS collection has just added several new shapes for their broadcast technology products. - The HP collection has added the new P6000 Storage System both Physical and Logical shapes. Also added are Logical shapes for the 3PAR F-Class Storage System, the 3PAR T-Class Storage System, and the P9500 Storage System. - The HP collection has added the new E5000 Messaging system, more 3COM MSR Routers, and some new Cisco SAN Switches. - The HP collection has added a bunch of 3Com wireless products, some 3Com MSR routers, the new ProLiant SL390 G7 4U server, a few racks and accessories, as well as some 3D shapes for the 3PAR F-Class and T-Class Storage systems. - The HP collection has added the new 3PAR F-Class Storage system, the 3Com A6600 Routers, and the iPDU power bars. - The HP collection has updated several logical shapes for Blades, ProLiants, and the new Integrity rx2800 i2. - The HP collection has updated all of the ProLiant BL, DL, ML, and SL VSD Documents, as well as added the new D2200 Storage Blade, the P2000 1Gb 4port iSCSI module, and a ton of line cards for the A8800 Routers. - The IBM collection has added the x3550 M3, N3400, N6060, N7700, N7900, EXN3000 and HMC CR5 and CR6 racks. 01-Jan-11 - New Collection for a New Year! - Voltaire has just joined the VisioCafe and added several Infiniband switches to their collection. - The HP collection has added the rear view of the new rx2800 i2 Integrity System, several updates to the A-Series Network Switches, the new ProLiant DL2000 servers, the new Brocade 64port line card, and several new Storage Servers. - Jacob Balser's Xyratex collection gets updated with their new 6500 line of RAID and EBOD storage products. - The VSDfx collection has added a bunch more 3D Isometric shapes, this time for Apple! - The HP collection has added the new rx2800 i2 Integrity System, the new E-Series modular E5400 and E8200 Switches, and the A8800 series routers. - The HP collection has added the new BL460c G7 Blade server, the new DL980 G7 rear view, the P2000 10Gb iSCSI module, a couple Storage Servers, as well as another bunch of 3com Networking shapes. - The HP collection has added the new G7 Blade servers, the new SL servers, as well as a large number of 3com Networking shapes. - The HP collection has added the new P9500 storage system, the P2000 10Gb iSCSI storage module, and the ProLiant MicroServer. - Steven Tunstall has added a set of stencils for the new Oracle/Sun 7x10 Server series products. - The NetApp collection has added 600GB and 2.0TB disk sizes to several products. - The Dell collection has added the new PowerVault MD3200, MD3200i, MD3220, and MD3220i, as well as added some panels to the racks set. 16-Apr-10 - FalconStor joins the VisioCafe! - FalconStor has just released a new collection of Visio stencils for their storage hardware and software products. - The FTS collection has added the new PRIMERGY CX Cloud eXtension servers, and the PRIMERGY RX600 S5. - The Dell collection has added the new PowerEdge R310, R810, R815, and R910 as well as the new M910 Blade. - The HP collection has added some new ProLiants, some new Tape drives, and a brand new set of Printer stencils. - The Dell collection has added the new C1100, 2100, and 6100 servers as well as the DD140, DD610 and DD630 Storage products. - The Dell collection has added the new PowerEdge R510 12-disk front, front-open, and rear views. - The FTS collection has added the new PRIMERGY RX200 S6, RX300 S6 and TX300 S6. - The Eaton collection has added several Monitored, Switched, Transfer Switched, and EFLX ePDUs. - The HP collection has added several wireless LAN products, the new 3500yl ProCurve switches, and some new 3D items. - The HP collection has added several new Disks, the new LeftHand products, the new BL2x220c G6 blade, and a few other changes. - Matt Calvert - brings a new collection to the VisioCafe, consisting of few older SUN and Dell shapes that he couldn't find anywhere else, so he made his own. - The HP collection has added several wireless LAN products, the new R/T3000 UPS's, and a few other changes. - Microsoft has just added Information and links to many of their stencils, templates, and Add-Ins. - The HP collection has updated all of the ProLiant BL, DL, ML, and SL VSD Documents and Logical stencils as well as added the new BL2x220c G6 and SL165z G6, and a few other changes. - The Dell collection has just added some new shapes for their 5600R UPS product. - Jacob Balser - Added some new Onestor models, and updated the rest of the set to now have "snap to rack" functionality. 30-Sep-09 - SUN updates in Jean Dion's collection! - The Jean Dion collection has added three new sets of stencils for the SUN M-Series, T-Series, and X-Series products. - The Eaton collection has added new 5130 UPS Models. - The NetApp collection has added the new FAS2040 Series Storage System. - The HP collection has updated all of the ProLiant BL, DL, ML, and SL VSD Documents and Logical stencils. - The NetApp collection has added the new DS4243 Disk Shelf, and added several IO cards. - The HP collection has added a ton of new network products to the ProCurve set. - The FTS collection has updated the entire collection, and added several new shapes. - The HP collection has added the new Z Series Workstations, as well as a couple new items in the ProCurve Wireless set. - The HP collection has added several 3D ProLiant DLs, and MLs, and a whole set of thin client shapes. 13-Jul-09 - More 3D Isometric shapes! - The HP 3D collection has added several new 3D shapes including several B_Series SAN switches, and some Tape libraries. - The VSDfx 3D collection has added several shapes to its 3D set including computer accessories, Brocade switches, and general office items. 18-Jun-09 - Isilon joins VisioCafe! - The Isilon collection has added a full set of stencils for their IQ and EX series storage solutions products. - The HP collection has added several more new G6 version ProLiant DLs, MLs, and Blades, as well as the new MSA2000 G2, and the new StorageServers. - The HP collection has added a couple more ProLiant DL shapes, but mainly this weeks update includes all the Logical stencils for blades, G5 ProLiants, and G6 ProLiants. The VSD documents have all been added or revised as well. - The HP collection has added a couple more ProLiant MLs, as well as new Blades, the new LeftHand storage systems, and the MDS600 Disk. - The HP collection has added more of the new G6 version ProLiants, as well as a bunch of ProCurve and Disk shapes. - The Bruce Pullig collection has just been updated with the SUN M3000, M4000, M5000, and SunBlade 6000 servers. - The HP collection has added several of the new G6 version ProLiant DLs and MLs, as well as a ton of new 3D shapes. 23-Mar-09 - Updates for DataDomain, HP, and NetApp - and another new collection! - The DataDomain collection has added the new DD660 product shapes. - The HP collection has added some LCD panels, the DC7500 SFF PC, the RDX 160 disk and made a couple small corrections. - The NetApp collection has renamed and reorganized its files and split the set into "Current" and "Classic". - The Various page now has Hayden Searle's collection of shapes for McAfee. - The HP collection has added the new EVA arrays, and the LeftHand SAN array and several other smaller changes. - The NetApp collection has added 450GB disk choices to the FAS20x0 and the DS14mk4, as well as added a couple FAS front open shapes. - The DataDomain collection has added several new IO cards to their IO card set. - The HP collection has added the new MSM410 Access Points, and a correction to the ProLiant DL580g5. - The NetApp collection has added several new IO cards to their IO card set. - The HP collection has just updated the Visual Solution Documents for the updated ProLiants and Blades, as well as Updates to the ProLiant Logical stencil sets with all the new Processor and Memory options. There is also a new Logical for the MSA2324fc, and the MSL series Tape Libraries. - The NetApp collection has just updated all 3D shapes to new box standard with new "Hide Box" feature for mounting the 3D shapes in a 3D rack. 13-Feb-09 - New update for BLADE Network Technologies! - The BLADE collection has added the new G8124 RackSwitch. 09-Feb-09 - More updates for HP! - The HP collection has added a bunch of 3D disk shapes, some new Floor layout shapes, and a few other additions/corrections. - The HP set has just added a ton of new shapes including a new ProLiant, ProCurve switches, an MSA disk, a SAN switch, and a whole collection of HP specific PCI Interface cards. 12-Jan-09 - A New Collection Joins VisioCafe! - The EVS collection is developed by EVS, and contains shapes for their broadcast technology products. - The HP collection has just updated the Visual Solution Documents for the updated ProLiants and Blades, as well as Updates to the ProLiant Logical stencil sets with all the new Processor and Memory options. - The Fujitsu Siemens Computers collection has just updated their set of PRIMERGY Visio shapes. 1-Dec-08 - HP updates again! - The HP collection has added the several new wireless switches in the ProCurve set, and several rear views of servers in the StorageServer set. - The Dell collection has just added the front and rear views of the PowerEdge R805 and R905. 17-Nov-08 - More updates for HP! - The HP collection has added the new Extreme Data Storage system ExDS9100, the new ProLiant DL365g5p, a bunch of new UPS's, and some new items for the C_class Blades. - The HP collection has added several interfaces for the DC SAN B_Series Backbone Switch. Many other shapes were also moved to Classic. - The VSDfx collection has added the Brocade DCX Backbone Switch and all cards, as well as the Voltaire ISR2012 switch. - The HDS set has added shapes for their new Adaptable Modular Storage 2000 products. - The NetApp collection has just added shapes for their new FAS3160 product. 3-Nov-08 - Updates for the HP 3D set! - The HP collection has added the a ton of shapes to the 3D blades set, including the c3000 Blade system, the HP BladePC, and separate snap-in Blade shapes for use with empty versions of the c3000 and c7000 chassis. Also added are floor plan shapes for the MCS g2 cooling rack. - The Dell collection has just added some PowerVault shapes, as well as new Blades and interconnects. - The IBM collection has added a several SAN switches including the SAN16B, SAN32B, SAN64B and SAN256B series. - The Dell collection has just added the new Dell/EMC CX4 Storage System shapes. - The HP collection has just updated the Visual Solution Documents for all the new and updated ProLiants, as well as Updates to the ProLiant Logical stencil sets with all the new Processor and Memory options. - The Dell collection has just added the new PowerConnect 3500 and 5400 Series Switch shapes. 22-Sep-08 - HP Updates again! - The HP collection has added Logical stencils for the MSA and EVA series Storage Systems, as well as updated the Visual Solution Documents and the Logical stencils for all the HP9000 PaRisc Servers. - The HP set has just added the new BL495c G5 Virtualization server blade for the c_class blade system, as well as the new MSA2012sa storage system. 10-Sep-08 - An Update to the DELL set! - The Dell collection has just added the new EqualLogic PS5500E shapes. 8-Sep-08 - An update to the EMC set! - The EMC collection has just added the new Celerra NX4, CLARiiON CX4 and AX4, and updates to the Standby Power Supply (SPS) shapes. 2-Sep-08 - A New Collection Joins VisioCafe! - The BLADE Network Technologies collection is developed by VSD Grafx Inc, and contains shapes for their RackSwitch top-of-rack and blade networking solutions products. - The HP collection has updated the Visual Solution Documents for the Integrity Servers, as well as Updates to the Integrity Logical stencil set with all the new Processor and Memory options. - The IBM collection has added a SAN Volume Controller, some modules for the Blade Center, and some options for the Power 570. - The Bruce Pullig collection has just been updated with the SUN T5120 and T5220 servers. - The HP collection has added the new Power Distribution Racks, and the rp36000/3 UPS as well as several other small changes. - The IBM collection has updated some items in the Racks set, as well as added the Power 575 node and 7314-G30 drawer. - The HP set has just added the new 8GB SAN Switches for the c_class blade system, as well as AMC Carrier grade and AMC modules. Also added were the rear views of several ProLiants, as well as the DL785g5 8cpu front views. 14-Jul-08 - More 3D Isometric shapes! - The HP 3D collection has added several new ProLiant 3D shapes including the new DL785g5, DL120g5, DL16x g5, DL18x g5, DL145 g3, DL580 g5, ML150 g5 tower, ML350 g5 tower, ML370 g5 tower, and ML570g4 tower. - The VSDfx 3D collection has added several shapes to its 3D set including monitor combos, a security monitoring desk, and a supercomputer to the computers set, a large router to the network set, and a new set called VSDfx-Office-3D which has several phone, and PBX shapes. 9-Jul-08 - An update from BlueArc! - The BlueArc collection has just added shapes for the Titan3 series and several other changes. - The Dell collection has just been updated with the PowerVault MD1120. - The HP collection has added a couple new ProCurve Switches, the DL785g5 Logicals, and the new StorageWorks D2D2500 and 4000. - The IBM collection has just added some shapes for the iDataPlex and also some I/O cards. - The HP set has just added the new 8GB B-Series SANSwitches to the SAN set, the new All in One 1200r and DL185g5 Storage Server, and the new LTO1760 half height SCSI tape drive. - The NetApp collection has just added the new FAS3140/3170 and V3140/3170 as well as a new 3D FAS2x0 shape, and several updates to other files with the new standard Logos. - The HP collection has just updated a few things to the MSA set, the ProCurve set, and the Tape set. - The IBM collection has just added new and updated Tape Library shapes and new BladeCenter switch module shapes. - The VSDfx collection has added two template files with 1 to 10 scale, and a true "Isometric grid" which is ideal for creating 3D Isometric Topology diagrams. There is a Letter size, and an A4 size. - The HP set has just added the new BL2x220 G5 blade to the C-class Blades set, some UPS's to the UPS set, and the Cisco MDS9134 and DC SAN Backbone Director to the SAN set. C-Class Blades set, and the new DL785g5. - The HP set has just added the BL870 and BL260 to the C-class Blades set, the DL585g5, DL365g5, ML115g5, ML150g5, and ML310g5 to the ProLiant sets, as well as some disk additions to the XP Disk Array sets. to the ProLiant DL and ML Logical stencil sets. There were also a couple updates to the Tape-small set. - The HP set has just added the DL165g5 and DL120g5 as well as made a lot of updates to the ProLiant DL Logical set, as well as a few other changes. The IBM collection has gone through some file reorganization and added new PDUs, Power systems and System i shapes. 2-Apr-08 - A New Collection Joins VisioCafe! - The Eaton collection is developed by VSD Grafx Inc, and contains shapes for the IBM DPI Ultra Density PDU family of power distribution products. 26-Mar-08 - IBM adds a 3D Isometric set to their collection! - The IBM collection has just added a set of 3D Isometric shapes for the POWER520, 550 and 570 rack and tower models as well as the System p520 and p550 rack and tower models, the D20 I/O shelf, and the 595 server and expansion racks. - The Dell collection has just been updated with Added EqualLogic PS5000 Series Front and Rear Views. - The HP set has just added the new MSA2000 disk systems, and vertical c3000 chassis for the C-Class Blades set. - The IBM set has been updated with several UPS's, some new System X servers, and an addition to the Workstation set. - The NetApp collection has just updated their template page, and Essentials files with their new standard Logos. - The IBM set has just added the HC10, JS22, and QS21 Server blades as well as the HT and S Blade Chassis all associated components. - The HP set has just added the new EVA4400 series of products, and it's associated SAN switches. 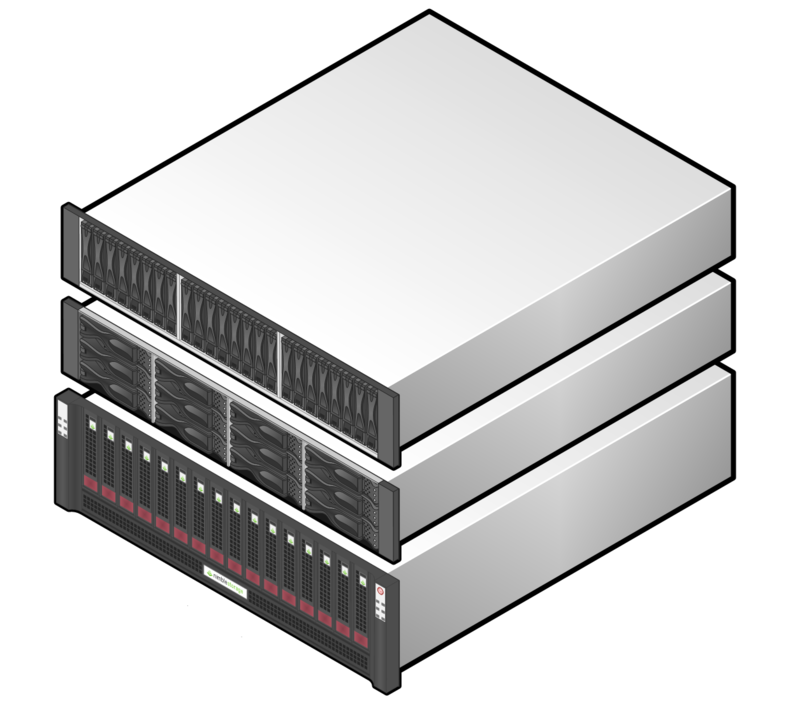 There is also the new D2D130 backup system added to the StorageServer set. - The Dell collection has just been updated with a whole newly drawn collection of PowerEdge stencils for PowerEdge BladeServers, RackServers, and TowerServers. The new shapes are developed by VSD Grafx Inc.
- The DataDomain collection adds shapes for the newly announced DD120 Deduplication Storage Appliance for remote offices. 18-Feb-08 - Two New Collections Join VisioCafe! - The BlueArc collection is developed in house at BlueArc and contains shapes for the 8000-Titan series and associated shapes. - The Mitel collection is developed by VSD Grafx Inc. and contains shapes for the 3300 family of communications products. - The HP set has just added a the new BL870c Integrity blade, the new ProLiant DL180g5, as well as several new Storage Server products. - The IBM set has just added the System p 520/550 POWER6 Rack and Tower Front and Rear Views and Integrated Virtual Ethernet (IVE) Options. - The HP set has just been updated with some new ProCurves, some additions to the Superdome logicals, and a new KVM. - The NetApp collection has just updated some disk sizes for their disk shelves and FAS270 products. - The VSDfx collection has just updated their 3D collection with several more Generic Computer, Network and Peripheral pieces in the VSDfx-3D set, and adds new 3D sets for Brocade and Cisco SAN switches! - The HP set has just added a lots of new ProLiants, as well as a couple things for the C-Class Blades set. - The IBM set has been updated with the long awaited DS3300 and EXP24 storage shapes. - The HP set has just been updated with many small changes to the ProCurve sets, as well as LTO 1840 updates for the Tape Library products. 24-Dec-07 - More Updates for HP and VSDfx and a new addition! Integrity Logicals, a new ProLiant, and a new Cisco switch. - Bas Dorland - Brings a new set to VisioCafe. Bas's set has shapes for Virtuozzo. - The VSDfx collection has just added MDS9222i front and rear, and DS-X9304 Multiservice card to the Cisco-SAN set. - The HP set has just been updated with some new ProCurve Software and Wireless shapes, as well as many Logical updates for the Proliant DLs. - The VSDfx collection has just updated the Voltaire HiPerf Switch set with the new DDR cards, and Router cards. - The HP set has just added the Logical shapes for the c3000 c-class Blade system, the BL680c Blade, as well as several updates to the other blades and components. - The HP set has just been updated with the new C-Class Tape Blade, the new ML110g5 and ML310g5, and some updated DAT160 Tapes. - The HP set has just been updated with the new VLS9000 Virtual Library System, a new ProCurve switch, and a new SAN switch. The new Secure Key Manager has also been added to the Tape library sets. - The EMC collection has just been updated with additions of the NEBS versions of the NS40, CX3-10, 20, and 40, as well as the Nebs DAE4. - The HP set has just added the new 300GB 15k array group for the XP24000, and Logical shapes for the XP20000. - The HP set has just added a new c-class blade module, the new ProLiant DL580g5, and a fix to the SAN set. - The IBM set has been updated with a ton of new n-series storage shapes. 5-Oct-07 - Another Collection on the Cafe! - Server Technology has just released a new collection of Visio stencils for their -48 VDC and AC PDU's for data center cabinet power distribution. This includes front and rear illustrations. - The HP set has just been updated with the new XP20000, as well as the c3000 KVM, the IP distance gateway for the EVA, and a P800 I/O card. - The IBM set has been updated with a ton of X-Series rear views. - The HP set has just been updated with the new c3000 C-Class Blade enclosure as well as the BL680c Blade, the SB600c All-in-One Blade, many updates to the ProCurve set including the new 8212zl Switch Chassis and it's associated parts, and finally three new Virtual Library Systems. - The NetApp collection has just added 3D, front, front open, and rear views of the new FAS2020 and 2050 series, as well as more IO cards. - The EMC collection has just been updated with additions of the new NS20, NS40, and NS80 products to the Celerra set, as well as new CX3-10, CX3-20, CX3-40, and CX3-80 front and rear views to the CLARiiON set. - The Emcor set has added more front panel pieces as well as many changes throughout the set. - The HP set has just updated the Superdome Logicals and added a ton of new desktop PCs and Monitors. 20-Aug-07	- More Visual Solution Documents and more Updated stencils. - The HP "Visual Solution Documents" Collection has just added five more documents and updated seven others in the ProLiant category. changes to the Classic files and other small changes throughout the collection. 16-Aug-07 - Announcing the new nCipher Visio collection! - There is a brand new collection from nCipher that has just been added to VisioCafe. The collection was created by VSD Grafx, and it contains front and rear views of nCipher's products. 6-Aug-07	- More Visual Solution Documents and more Updated stencils. - The HP "Visual Solution Documents" Collection has just added eight documents and updated four others in the ProLiant DL category. There are changes and additions to the ProLiant ML logical stencils as well as changes to the PaRisc and Integrity Logicals. 27-Jul-07 - Another Update to the HP set! - The HP set has just updated the ProLiant DL Logicals and added the new LTO1840 Tape drive. - The HDS set has added some 3D shapes for their Universal Storage Platform V, Storage Virtualization product. - The IBM set has been updated with DS3200/DS3400 shapes, and a EXP3000 rear view shape. 16-Jul-07 - Another HP Update and a new addition to the Cafe! - The HP set has some updates to the C-Class Blades set, some additions to the SAN set, and a couple changes to the Telecom set. - Bryce Bowman - Brings a new set to VisioCafe. Bryce's set has a Coyote Systems equalizer traffic switch. 9-Jul-07 - Announcing a new collection! - There is a brand new collection from Data Domain that has just been added to VisioCafe. The collection was created by VSD Grafx, and it contains front and rear views of Data Domain's Storage products. - The VSDfx collection has just added many more shapes to its new 3D collection. This time many generic computers, people, email symbols and many more. - The HP set has just added a whole set of new 3D isometric shapes. Includes 3D shapes for Blades, Desktops, Disk, Integrity, ProCurve, ProLiant and Tape products. - The IBM set has been updated with some new Tape, Systemx and Workstation shapes. - The NetApp collection has just added front and rear views of the FAS900 series, as well as the R200. - The HDS set has added the HiPerf NAS with BlueArc to the set. - The HP set has just been updated with a lot of ProCurves, a ProLiant, a B_Series SAN Switch, and a module for the C_Class Blade system. 21-May-07 - Another Update to the HP set! - The HP set has just been updated with some new Logicals to the Integrity set, the Modular disk set, and the new XP24000 set. 16-May-07 - Fujitsu Siemens Computers and Bruce Pullig Updates. - Bruce Pullig has added the shapes for Project BlackBox, and a new Sun Logo. - Fujitsu Siemens Computers has added to their Primergy and Storage sets. 16-May-07 - Dell brings their existing set to the VisioCafe! - Dell's Visio collection includes stencils for PowerEdge, PowerVault, PowerConnect, EMC and others. 14-May-07 - Several Updates in the HP and IBM sets. - The HP set has added the new XP24000 Disk array, the Tape Blade for the c-class, and the logical shape for the new GbE2c L2/3 Switch. 23-Apr-07 - Another small Update in the HP set. - The HP set has added a new rear for the XW9400 racked workstation, and fixed up a couple things in the PaRisc and Integrity sets. 16-Apr-07 - Fujitsu Siemens Computers has just brought their Visio Collection to the Cafe! - Fujitsu Siemens Computers has a full set of PRIMERGY, Storage, and Business client Visio shapes. 16-Apr-07 - Some small Updates in the HP and IBM sets. - The HP set has added a couple PCI cards to the ProLiant Logical sets, and cleaned up and reorganized some classic shapes. 2-Apr-07 - Another Update to the HP set! - The HP set has just been updated with some new ProLiants, a lot of I/O card updates to the Integrity set, and other small changes. - HDS has added the HiPerf NAS with BlueArc to the set. - The HP set has just added a bunch of shapes for the new ProCurve switches and a couple new Logical shapes for SAN products. - NetApp has added a couple of new four port Fibre PCI cards. - NetApp has added the Decru Lifetime Key Management appliance, the DS14mk4 disk shelf, the FAS3040, and several small improvements. 5-Mar-07 - More Updates to the HP set, and the IBM set! - The HP set has just been updated with new D2D Backup system, and a lot of processor updates to the ProLiant DL and BL sets. - The IBM set has added a lot of tape products for TotalStorage and SystemStorage. - The HP updates include the new GbE2c L2/3 switch for the c-class blade system, and the new processors for the Superdome. 21-Feb-07 - Hitachi Vantara Joins the Cafe, and Bruce Pullig has a new update! - The HDS set brings a complete set of Storage Shapes for their full line of products. - The Bruce Pullig set has added many new SUN Servers and Workstations. - The HP updates include the new rx2660 Integrity server, the BL860c Integrity blade, new racks, new I/O cards, and several other updates. 12-Feb-07 - More Updates to the HP set, and the IBM set! - The HP set has just been updated with new C-class Blade products, a new All-In-One server, and a new MSL Tape Library. - The IBM set has some new System X servers, SystemStorage Disks, and some new small Disks and Tapes. - The HP set has just added a bunch of UPS's, the Cisco 9124e card for the C-class blade system, the rear of the DL145g3, and the DL585g2 Storage server..
- NetApp has added the FAS270c and FAS270 fronts and rears. - The VSDfx collection has just added a set of shapes to help with the creation of Isometric Topology drawings. These are meant to compliment the 3D Isometric shapes that come with Visio 2003 and 2007. There will be many additions to this set in the coming weeks and months! - The HP updates include the new MSA70 disk enclosure, and some small updates to the ProLiant and Blades sets. - The HP collection has just been updated with most of the ProLiant servers and Blades getting CPU updates with the latest quad core chips, as well as many other updates throughout the collection. - The HP updates include some fixes and additions to the NonStop set as well as a couple new IO cards and a few older disk products being moved to the Classic section. - The HP collection has just been updated with additions to the Telecom Stencil, and a couple corrections to the Blades Logical Stencil. - NetApp has just added a full set of Decru Datafort front and rear shapes. - The HP updates include some fixes and additions to the Integrity Logicals and their corresponding Visual Solution Documents, as well as many updates and additions to the ProLiant Logical sets. 8-Dec-06 - A new addition to the Various page. - The Various page now has added Geoff Barnett's collection of Citrix shapes. The set includes the "Citrix Access Gateway". - StevenTunstall's un-official collection of SUN and StorageTek shapes is back online with many updates throughout. - The HP updates include rear views of some SAN switches, as well as cable tray shapes for the Floor-Layout set. - The VSD Grafx set has added the new versions of the ISR 9024 to the "Network-Voltaire.vss" set. - The HP set has just been updated with additions to the Workstation set as well as a few small fixes in some other sets. - NetApp has made one correction in their Nearline set, for the VTL300 Bundle. - The Blade set has been updated with the BL865 and BL20pG4. The ProLiant set has the new DL320s and DL365. The Disk set has the new DS2500 and MSA60 as well as many updates. There are also several new StorageServers, a new tape autoloader, and many other updates. 13-Nov-06 - Announcing The Arrival of NetApp's Official Stencil Collection! - NetApp's official collection of Visio stencils is being developed by VSD Grafx. This collection includes front and rear physical views of all of NetApp's current products, as well as 3d isometric design shapes and presentation icon shapes. - The Blade set has been updated with the HP BLadeSystem Blade PC products, new p-class blades, and a new module for the c-class system. 23-Oct-06 - More Updates to the HP set, and the IBM set! - The HP set has just been updated with Logical shapes for the new c-class Blade system, some PDU's, and the Telecom Blade system. - The IBM set has some updated blades and and modules in the BladeCenter set. - The ProCurve set has been updated with the 2900 series of switches, fronts and rears, and rear views of the 3500yl series, and the 6200yl. - The HP "Visual Solution Documents" Collection now has new documents for the new rx3600 and rx6600 Integrity Servers. 25-Sep-06 - Announcing! New Additions to the VisioCafe! - EMC's official collection of Visio stencils developed by VSD Grafx includes front and rear physical views of Celerra, Centera, CLARiiON, and Symmetrix products to the Cafe. - *Coming Soon! NetApp's official collection of Visio stencils is being developed by VSD Grafx. This collection will include front and rear physical views of all of NetApp's current products, as well as 3d isometric shapes. - StevenTunstall's un-official collection of SUN and StorageTek shapes. 25-Sep-06 - New additions to the HP Stencils. - The HP collection has just had a big update including new Blade components, new ProLiants, new Tape products, new SAN products, and several other additions and fixes. - The new Integrity rx3600 and rx6600 servers have arrived, as well as several new ProCurve switches, a couple new Cisco SAN switches, some tape drives, and various other updates. 4-Sep-06 - New additions to the IBM Stencils. - The IBM collection has just had a big update to the TotalStorage set including rear views of the DS4xxx products, the DS6xxx products and the EXP100 and 710 products. - There are a bunch of rear views of the new ProLiants, and some updates to the Alpha Logicals. 21-Aug-06 - New HP Stencils, and Updated Visual Solution Documents. - The HP "Visual Solution Documents" Collection has just updated two documents and there are several Stencil updates to the Tape set, the SAN set, and the IA64 and Superdome sets. 14-Aug-06 - Some HP stencil updates, and a new Visual Solution Template. - The HP "Visual Solution Templates" Section has just added a new Template for the Medical Archive Server. In the Stencils section there is a new DAT72x10 Tape Autoloader, as well as the Remote Monitoring Unit for the Monitored PDU's. 7-Aug-06 - More Visual Solution Documents and more Updated stencils. - The HP "Visual Solution Documents" Collection has just added six documents and updated another in the ProLiant family. There are also a few updates to the ProLiant DL and ML logical stencils. - The IBM set has more additions to the BladeCenter set with rear views, and there are a bunch of new xSeries Tower front views. 24-Jul-06	- More Visual Solution Documents and more Updated stencils. - The HP "Visual Solution Documents" Collection has just added four documents and updated ten others in the Integrity and ProLiant category. There are also additions to the ProLiant DL and ML logical stencils for the new G5 ProLiant servers. - The IBM set has more additions to the BladeCenter set with HS, JS, and HS Blades, as well as the H and T chassis. 10-Jul-06 - New IBM set, and new HP servers! - The IBM set now includes xSeries!. So far we have the front views of the 325, 326, 335, 336, 343, 345, 346, 365, 382 ,366, 445, 455, RXE100 and 460! Stay tuned over the next while for much more. - The HP set has just been updated with the new G5 series ProLiants, and a few more pieces for the new c-class Blade system. 26-Jun-06 - More ProLiant Visual Solution Documents and Updated stencils. - The HP "Visual Solution Documents" Collection has just added four documents and updated six more documents in the ProLiant category. There are also updates to the ProLiant ML logical stencils, and rear views for the new C-class Blade system. - The IBM set has more additions to the pSeries set with System p5 575 cluster node, a 24inch rack, and associated products. 19-Jun-06 - More HP updates - A new stencil file for the C-Class Blade system, new Logicals for the rx8640 and rx7640, updates to the DL logicals including the new DL580g4, and additions to the Superdome Logicals for the new sx2000 based system. 12-Jun-06	- More ProLiant Visual Solution Documents. - The HP "Visual Solution Documents" Collection has just added three documents and eight updated more documents in the ProLiant category. 29-May-06 - Another Update for HP - Another huge update to the ProCurve-Wireless+WAN set, the new fronts for the rx7640 and 8640, the new ProLiant DL580g4 and ML570g4, and the VLS6800. - There are new ProLiants, new NonStops, new Rack accessories, and new options for the XP disk arrays. 15-May-06 - More HP updates - A huge update to the Blades Logical shapes, a bunch of new shapes in the ProCurve-Wireless+WAN set, and a few other fixes too. 8-May-06	- More Visual Solution Documents, and a new Collection! - The HP updates include many updates to the ProCurve products including many new switches. 24-Apr-06	- More Visual Solution Documents, and a new Collection! - The HP "Visual Solution Documents" Collection has just added three more documents for the DL360g4p variations. - Tony Reichmuth brings a set of un-official SUN and EMC Stencils. Check them out! - There have been huge updates to the ProCurve set both in terms of new products, and the rebuilding of the "Large" switches to improve file size/performance. There was also one addition to the Workstations set, and one fix to the ProLiant Logicals. 10-Apr-06	- More Visual Solution Documents Updates! - The HP "Visual Solution Documents" Collection has just had all the current AlphaServer Documents updated. 3-Apr-06 - More HP updates - This time the G2 Racks and the Modular Cooling System have been added to the Floor-Layout set, a new wiring harness for the EVA 6000 2C4D, and some new rear views of the medium sized ProCurve switches. 27-Mar-06	- More new Visual Solution Documents! - The HP Additions include a whole bunch of New "Visual Solution Documents". This time the additions are for StorageWorks EVA and MSA disk arrays, as well as a couple ProLiant Clusters with MSA disks. 20-Mar-06 - A Bunch more HP updates - There have been another huge pile of updates in many of the HP sets. They include another bundle in the Clusters set, updates to the MSA and EVA disk arrays in the Disk set, new products in the Tape set, the Racks set, and the new StorageServer set. There are also several smaller fixes and additions in several other sets too. 13-Mar-06 - IBM updates - The IBM collection has another set! "IBM-UPS-PDU.vss" contains , you guessed it, UPS's and PDU's! There are also many updates to the IBM-Racks.vss set. 6-Mar-06 - A Bunch more HP updates - There have been huge updates to the Clusters set, the ProCurve set, and the PaRisc and IA64 Server sets, as well as lots of other fixes and improvements. 1-Mar-06	- A New Family of Solution Documents! - The HP collection adds two whole new families of "Visual Solution Documents" ! One for the Itanium based Integrity Servers, and the other for the PaRisc HP9000 Servers. 20-Feb-06 - Another large bundle of HP updates - There have been updates to the Logical shapes for PaRisc, IA64 and Blade Servers, additions to the bundled clusters, a new 42u G2 rack, the cx2600 in telecom, and lots of other fixes and improvements. - There has been another huge update to the ProCurve files (with even more to come), a bunch of updates to the MSA family, and a even more updates to the Logical shapes for ProLiant Servers. 30-Jan-06	- A Lot more updates! - The HP Additions include a whole bunch of updated "Visual Solution Documents" plus a few new ones, as well as a few stencil updates with corrections to the IA64, NonStop, and PaRisc sets. -The IBM collection has a whole new set! "IBM-TotalStorage-Disk.vss" contains the DS41/43/44/4800 products as well as DS6x00 and DS8x00, with more to come! There are also a couple additions to the IBM-Generic.vss set. 9-Jan-06 - A New year, and another large batch of HP updates - There has been a huge update to the ProCurve files, a new set for Clusters starting with the DL145's (with a lot more to come soon), and a few more updates to the Logical shapes for ProLiant Servers.